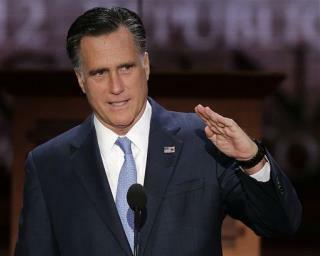 (Newser) – A smiling Mitt Romney grasped hands all the way to the stage before a booming Republican National Convention tonight to hail his record at Bain Capital, lash President Obama's failed "hope and change" that America "deserved," and present his vision for the future. He pointedly wooed the female vote, noting that his mother ran for Senate, that he picked a female chief of staff and lieutenant governor when he was governor of Massachusetts. "Why should women have any less to say about the great issues of the country than men?" he recalled his mother asking. He said his wife had the harder and more important job of the family, raising their children, and teared up recalling the days they were little. Romney also boasted of his experience with controversial investment company Bain Capital, calling it a "great American success story" that has provided him with insight into financial turnarounds. Yeah Mitt, You've been taking a page out of Clint's crazy conversation with chairs book. You get in and come 2016 you'll be talking about how you need four more years to get those 5M jobs. If you were interviewing a person for a job, would you buy into promises. Would you call him out for lieing to you while looking into your eyes?